EDITOR’S NOTE: The PP Blog is back — after its most recent brush with death led to a suspension of publishing that lasted through all or parts of six days. You’ll read more in the days ahead about certain changes the Blog plans to implement to safeguard its right to publish, to improve revenue, to make it less reliant on a small group of dedicated readers to put out fires and to keep its archives open to the people who can benefit most. As for the editorial below: Some of it is based on “Government Exhibit G” and other government exhibits in the criminal prosecution of AdSurfDaily Ponzi schemer Andy Bowdoin. Exhibit G was filed on Aug. 13, 2012, four days before the SEC went to federal court in Charlotte, N.C., and alleged that the Zeek Rewards MLM “program” was a $600 million Ponzi- and pyramid fraud that had victimized hundreds of thousands of participants. Among other things, Exhibit G addressed Bowdoin’s participation as a silent partner in the AdViewGlobal reload scam. Another court document filed by prosecutors on the same day addressed Bowdoin’s participation in OneX, which prosecutors described as yet-another MLM-style scam in which Bowdoin had participated after the U.S. Secret Service moved against ASD in August 2008 and eventually seized more than $80 million. AdSurfDaily Ponzi schemer Andy Bowdoin used a secret hushmail address in 2009 to discuss a bank wire for $38,750 that was to be sent to an account at Regions Bank in Fort Lauderdale, Fla., to pay for servers and programming required by AdViewGlobal. AVG, as it was known, was an ASD reload scam that began to unfold in October 2008, just two months after the U.S. Secret Service began the process of seizing more than $65.8 million from at least 10 Bank of America accounts linked to ASD, according to government records. The Secret Service, according to court filings, also had its eyes on separate Bank of America accounts linked to an ASD-connected enterprise known as Golden Panda Ad Builder. Golden Panda was operated by Rev. Walter Clarence Busby Jr., a Bowdoin business partner and Georgia grifter implicated by the SEC 11 years earlier in three prime-bank swindles, including one that promised to pay interest of 10,000 percent. Some of the Golden Panda money also made its way into Bartow County Bank, a small Georgia bank that later failed, costing the Federal Deposit Insurance Corp. an estimated $70 million, according to government records. From this fact set, one can plainly see that ASD and related scams had caused polluted money to flow to Bank of America and Bartow — and that the noxious and ever-evolving ASD enterprise now had its sights on causing polluted money to flow to Regions. That’s three banks put in harm’s way by what effectively was an evolving ASD criminal enterprise. That day was July 31, 2008. History shows that the Secret Service moved against ASD the very next day, Aug. 1, 2008, as a means of stopping the ASD Ponzi monster from sucking in any more cash and from polluting any more banks. The ASD member with the Wachovia accounts had “sponsored 6-8 people to get into the ASD system,” and somehow had managed to receive nearly $100,000 in tainted proceeds after paying ASD only $500 and working as a “consultant” to ASD “for a brief period,” according to court records. Because ASD used infected proceeds to pay members with accounts at banks across the U.S. spectrum of hundreds of institutions, each of those institutions became places at which wire-fraud proceeds were deposited. The total flow of fraudulent proceeds linked to Bowdoin and follow-up scams exceeded $120 million, according to federal court files. But it gets worse . . .
Why not infect Europe with American Ponzi proceeds? Bowdoin, prosecutors said, indeed was the personification of a con man and affinity fraudster who “boldly continued or expanded his criminal conduct” even after the Secret Service raid in August 2008. Just two months later, in October 2008, Bowdoin and a former ASD insider held discussions aimed at launching AVG, the ASD reload scam that allegedly sucked in millions of dollars — in part by targeting ASD members all over again. The sources for this information are a government sentencing memo and “Government Exhibit F,” filed on Aug. 13, 2012, four days before the SEC’s Zeek action and confirmation by the Secret Service that it also was investigating Zeek. Exhibit F is styled “Summary of AdView Global by T. Andy Bowdoin, Jr.” Precisely when and how the government obtained the document is unclear, but prosecutors say Bowdoin drafted it in “memo” form. Agents are known to have seized ASD-related computers. It also is believed that the government seized at least one AVG-related computer. The undated document features a narrative in which Bowdoin, despite the Secret Service raid of ASD and ongoing civil and criminal investigations, suggests he was still sticking to a cover story that ASD was an “advertising” company, not an investment company offering securities that paid a preposterous interest rate of 1 percent a day while magically constituting neither a Ponzi scheme nor an investment firm. In fact, according to the document, AVG hoped to ward off the U.S. government by establishing some sort of presence in Uruguay. These unidentified “attorneys” purportedly had advised Bowdoin that prosecutors would not be interested in establishing whether the AVG upstart “was OK,” even if Bowdoin submitted an AVG business plan, according to Exhibit F. Bowdoin then moved forward with AVG, despite all that had happened at ASD. Both before and after the ASD debacle, according to assertions by prosecutors, Bowdoin claimed he had acted “on the advice of counsel” and therefore had done nothing wrong. “Bowdoin’s reliance on the ‘advice of counsel’ defense became a theme in both the civil and criminal litigation,” prosecutors advised a federal judge. It was a defense that failed miserably, as various entries on the public record show. And when Bowdoin got in trouble again — this time for promoting an alleged pyramid scheme known as “OneX” while out on signature bond in the ASD criminal case even as he asserted the OneX “program” had been vetted by attorneys and passed muster and that recruits could earn to the limits of their imaginations — Bowdoin again defaulted to an advice-of-counsel defense. Back to AVG, the scheme Bowdoin helped launch before later trying to sanitize the alleged OneX pyramid scheme by claiming it had been scrubbed clean by attorneys: Bowdoin was to own two-thirds of AVG; the former ASD insider would own the remaining third, according to Exhibit F.
Web records show that AVG had come out of the gate with two impossible (if not insane) propositions: The first was that AVG was just like the NBC television network, an absurdity on its face in that NBC doesn’t pay its advertisers to watch ads. Moreover, NBC, unlike the collapsed AVG, doesn’t operate a closed network in which only NBC’s advertisers and not the public at large can view ads. Nor does NBC try to recruit advertisers by telling them they’ll receive a dividend of 125 percent (or more) on their ad spend within a few months and that its advertisers can earn downline commissions two levels deep by recruiting competitors to advertise on NBC’s closed network. AVG went on to pile on the absurdities, according to court filings. In Exhibit F, the document prosecutors say was Bowdoin’s draft memo of his AVG reflections, members of Bowdoin’s family who allegedly benefited from ASD Ponzi proceeds are described as heroes who tried to save AVG from the thieves. “TMS used a bank in the Caribbean,” according to the document. The signatory on the Caribbean account somehow never was changed after the asserted change in ownership at TMS, and two former TMS associates allegedly stole nearly $2.7 million from AVG. The theft of nearly $3 million led to the collapse of AVG, according to the telling attributed to Bowdoin in the document. To date, the PP Blog has been unable to ascertain the truthfulness of the assertions about the thefts allegedly committed by the alleged former TMS insiders. What is clear, however, is that as much ASD money that could be found in August 2008 was seized. AVG then launched with cash that hadn’t been seized, and in part was targeted at ASD members. AVG members then were left holding the bag, with the blame placed on former TMS associates. And something else is clear, which brings us to “Government Exhibit G”: AVG, the follow-up scam to ASD that involved Bowdoin and ASD insiders and alleged thefts of millions of dollars by outsiders, had at least two Swiss bank accounts. 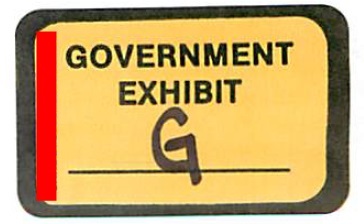 On Jan. 28, 2009, just days before AVG’s scheduled launch date in early February and less than six months after the Secret Service raid on ASD’s headquarters and Bowdoin’s home in Quincy, Fla., Gary Talbert used a Gmail address to email Andy Bowdoin at a hushmail address, according to Exhibit G.
Upon verification, the customer would make “another large wire,” Exhibit G suggests. Another email within the January 2009 chain says that AVG had at least two Swiss accounts. Walking this back and assuming the Exhibit G communications were truthful, what it means is that the ASD enterprise — this time in the form of AVG — had set up a banking operation in Switzerland, a secrecy haven. At the same time, it means that the ASD enterprise did this after it earlier had polluted U.S. banks in multiple states with fraudulent proceeds and now was taking its act not only to Switzerland, but also to South America, Central America and the Caribbean. Less clear is whether ASD had a preexisting banking network in Switzerland before effectively morphing into AVG. Regardless of when the Swiss accounts were opened, however, the mere presence of them suggests that ASD and AVG insiders had the means to move fraudulent proceeds from U.S.-based crimes offshore and perhaps tap into them later. And this brings us to Zeek Rewards, which also used domestic and offshore facilitators and the same fundamental business model of ASD and AVG. It also brings us to Profitable Sunrise and other MLM “programs” such as Better-Living Global Marketing. The now-disappeared Profitable Sunrise scheme allegedly used U.S. bank wires and offshore facilitators to drive tens of millions of dollars to the scheme. BLGM, still active, clearly has U.S. promoters and facilitators while purportedly operating from Hong Kong. Meanwhile, BLGM, like ASD, AVG, Profitable Sunrise and Zeek Rewards, has Stepfordian “defenders” running interference online. Got my Hongkong wire/remittance of 6,000 USD at Bank of America, have all my questions and concerns answered by Luke Teng, the teleconference helped a lot, disregard all the unnecessary comments of non-members. Get all your transparent answers from Luke Teng, or else you will die of stress reading all the negative comments of people who are not engaging, and guys remember this is our freewill and our own money, our decision, our own risk. TelexFree, a scheme more or less operating globally that has U.S. footprints in Massachusetts and Nevada and is under investigation in Brazil, also used Bank of America, according to members. Some TelexFree promoters instructed recruits to walk deposits meant for TelexFree into a Bank of American branch in Massachusetts or TD Bank locations elsewhere. TD Bank, of course, was the bank of Florida Ponzi schemer and racketeer Scott Rothstein. Four years after Rothstein’s $1 billion-plus scam brought great shame to the banking community, it’s still causing ripples. The PP Blog previously reported that a former Zeeker who also was associated with Profitable Sunrise — an alleged international pyramid scheme that funneled tens of millions of dollars to Europe, China and Panama amid the murkiest of circumstances — also was pushing BLGM. All of these “programs” are operating or have operated within the MLM sphere, the same sphere that produced the incredibly toxic ASD/AVG Ponzi schemes. All of the “programs” either have or had access to the wire facilities of various nations around the globe while using Ponzi- and pyramid schemes as their business model. Even after the PP Blog announced the temporary suspension of the publication of new stories last week, it continued to be targeted by resources-draining bots. One wave knocked the Blog offline for about an hour two days ago. During the involuntary outage, legitimate readers and researchers could not access the Blog. Another spammer — one that left an IP signature from Belarus — also targeted a Leaming story thread at the PP Blog. In recent weeks, the Blog has recorded data that plainly show that botnets, spambots or human spammers are circling antiscam sites and attempting to execute command strings that — if enough volume is applied — can cause databases to malfunction or even cause the sites to go offline. This creates an atmosphere that affects the publishing of information not only on current scams, but also on emerging scams and scams of the past. The downstream effects are potentially ruinous — and yet it continues. ASD and AVG were discredited long ago. But scams that use their core business model not only are launching, but in some cases thriving. Serial promoters are racing from one fraud scheme to the next. This sets the stage for schemes to fill up the world’s largest sports stadiums eight or 10 times over with victims. In 2008, ASD could have filled the Rose Bowl to capacity with victims one time. By 2012, Zeek could have filled the Rose Bowl with victims 10 times. The “defenses” for these various schemes range from the bizarre to the utterly mindless — and they absolutely must be decimated with the full, combined weight of the various world governments. It is in the interest of the worldwide public to connect the dots of these schemes and to eradicate them through the maximum application of the force of law. Left unchecked, they will erode the very foundations of freedom and permit the criminal underworld of MLM to thrive. NOTE: Our thanks to the ASDUpdates Blog. As George Santayana once said, ” Those who cannot remember the past are condemned to repeat it. But feds have other priorities, relocating all government resources for fighting outrageous counterfeiters of branded lady bags and taking down almost thousand sites which cause greatest damage to the nation as selling fake-brand underpriced items online for holiday season.